Charter or boat hire holidays are often associated with the Mediterranean or other sunny destinations, yet the advantages of chartering can apply almost anywhere, including our own magnificently varied coastline. Cruising motor boats are expensive depreciating assets and we all know that the costs of owning, maintaining and berthing one for a few weeks use each year can look ludicrous if you take a cold, clear accountant’s view. As a boat owner myself I avoid these calculations and sensible financial arguments rarely apply. But logistically, your boat can’t be everywhere at once. Unless you are retired or otherwise leisured, cruising to more out of the way corners of Britain can be quite an undertaking. A British charter lets you explore waters your own boat cannot easily reach, often at quite modest cost. It’s also fun to try out different types of boat for a while. The differences between ‘charter’ and ‘boat hire’ blur at the edges, but chartering usually refers to sea-going boats capable of coastal or open water cruises for which reasonable experience is needed. 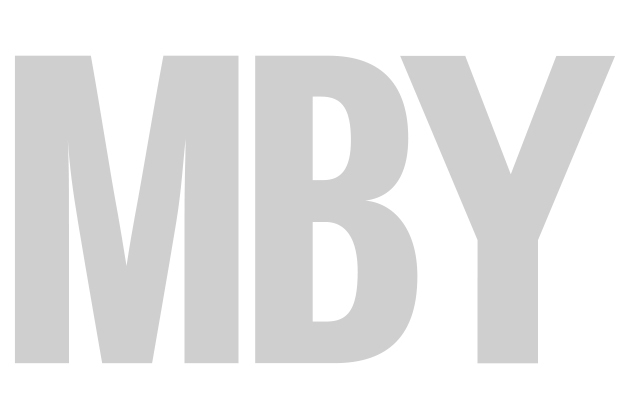 ‘Hiring’ tends to imply more sheltered or inland waters and boats which can be offered to relatively novice parties. But times have changed since the popular image of a hire boat was a somewhat battered looking cabin cruiser with a caravan interior – the kind of craft a seadog would be embarrassed to be seen aboard. The market has moved on and you can find some really comfortable and stylish boats for hire in stunning parts of Britain. In this article I look at five great British charter and hire areas, each with very different surroundings but all offering the chance of a fabulous week of carefree boating without the ties and responsibilities of ownership. Cutting across Scotland between Fort William and Inverness, the Great Glen is a massive natural fault, scoured by glaciation, which forms a long string of lochs. 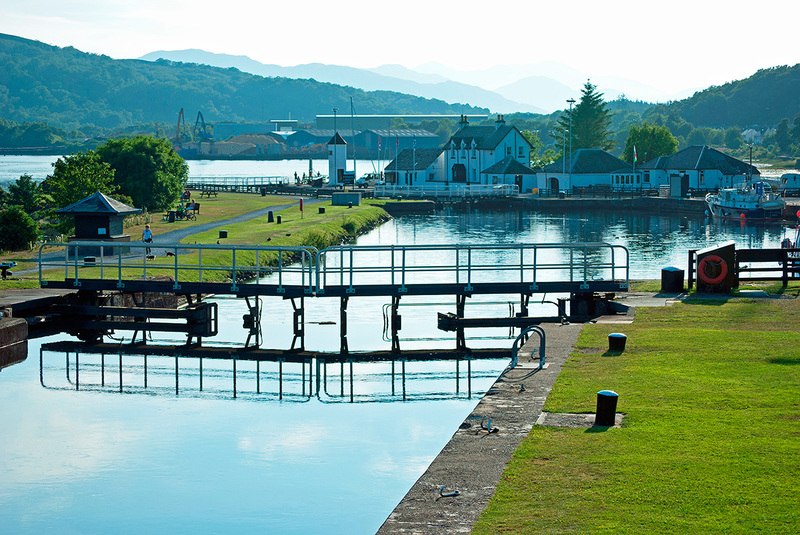 In this awesome valley, short man-made stretches of the Caledonian Canal join up the lochs to create a grand waterway linking Loch Linnhe in the west to the Moray Firth in the far north-east. This sheltered Atlantic to North Sea route was built in the early 19th century so that sailing ships could by-pass the hazardous open waters north of Scotland, around Cape Wrath and through the infamous Pentland Firth. 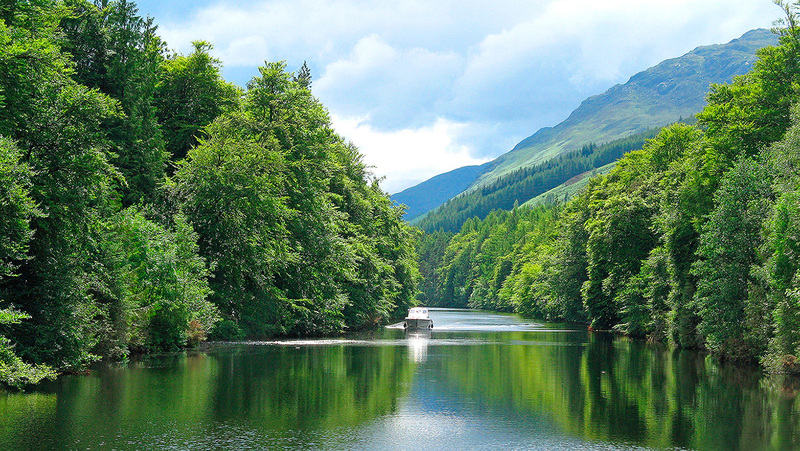 Fishing boats still use the Caledonian and this spectacular waterway provides a memorable passage for cruising yachts and motor boats. Along the 23 miles of Loch Ness, mountains rise steeply from the lakeside, their lower slopes covered by pines and bracken. There are few signs of life except for scattered cottages, a ruined castle and the specks of roaming sheep. The western reaches of the canal are dramatically shadowed by Ben Nevis. 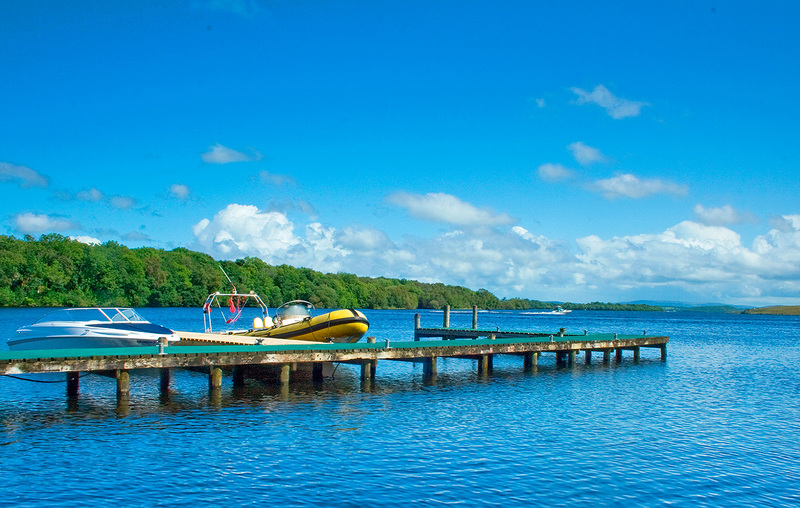 You can experience these inspirational waters by hiring a comfy motor boat from Caley Cruisers, a friendly family business based at the Inverness end of the Glen at the top of Muirtown Locks. It has a wide choice, but I recommend the 40ft Kintail or Torridon classes, which look and feel like real cruising boats. 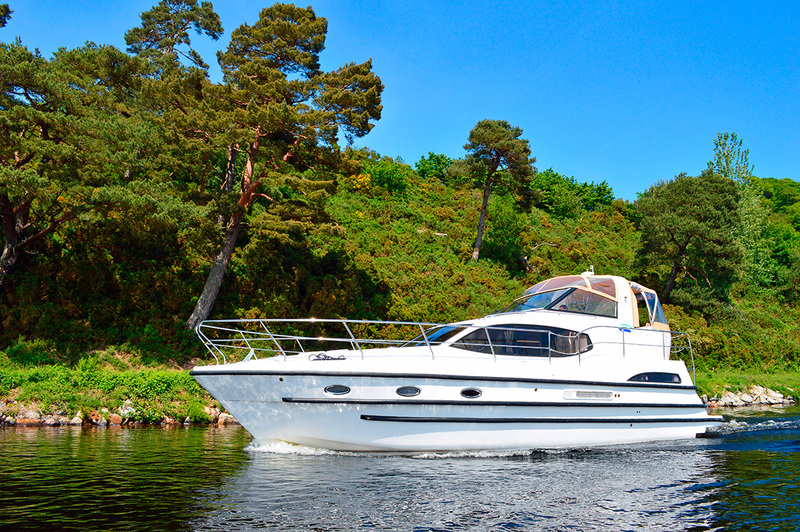 The Kintail is ideal for two couples, with double ensuite cabins fore and aft. Torridon (pictured below) uses the same hull, but has an additional side cabin with twin bunks. 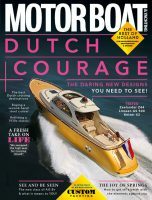 Both boats are helmed from a canopy bridge deck, powered by a Nanni 115hp shaftdrive diesel and fitted with thrusters. 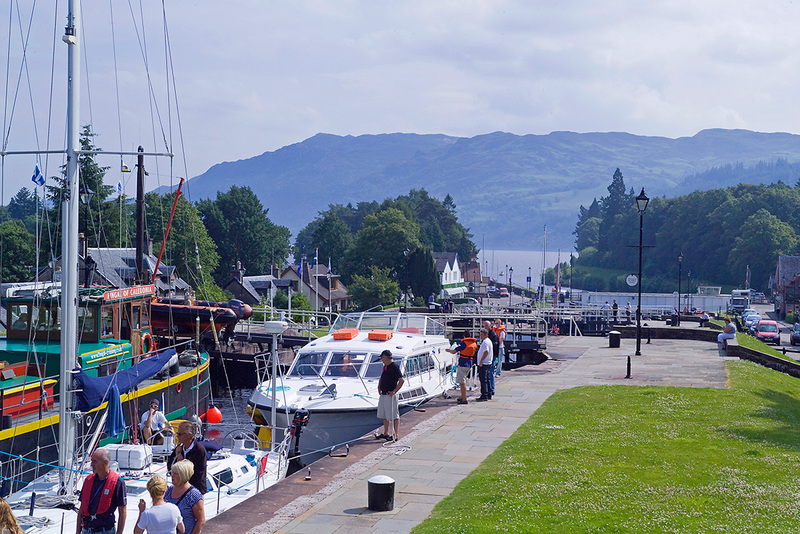 Your cruise starts through a swing-bridge and then it’s a few miles to Dochgarroch Lock before you reach the splendid expanses of Loch Ness. Now you can open up and admire the hillside views. At the end of Loch Ness is colourful Fort Augustus (pictured below), where a five-lock staircase climbs through the town with shops, pubs and grassy slopes on either side. Further west, Kytra Lock is an oasis of bright flowerbeds sheltered by fir trees. A river runs alongside the canal through Coiltry Reach where you pass small islands and natural digues that were once part of the water course. Cullochy Lock cottage is low and whitewashed like a highland croft. At Loch Oich you can moor near the ruins of Invergarry Castle and savour the magical stillness of Scotland’s vast open spaces. The nights are pitch black and perfectly quiet, except for the distant murmur of mountain streams. Guide prices: Kintail and Torridon boats cost from £1,677 to £1,890 per week low season, £2,321 to £2,667 high season excluding fuel (usually about £150-£200). Getting there: Caley Cruisers is 530 miles from the Bristol M4/M5 interchange, 550 miles from the M25/M1 and there are many UK flights to Inverness, then 25 mins taxi to Canal Road.